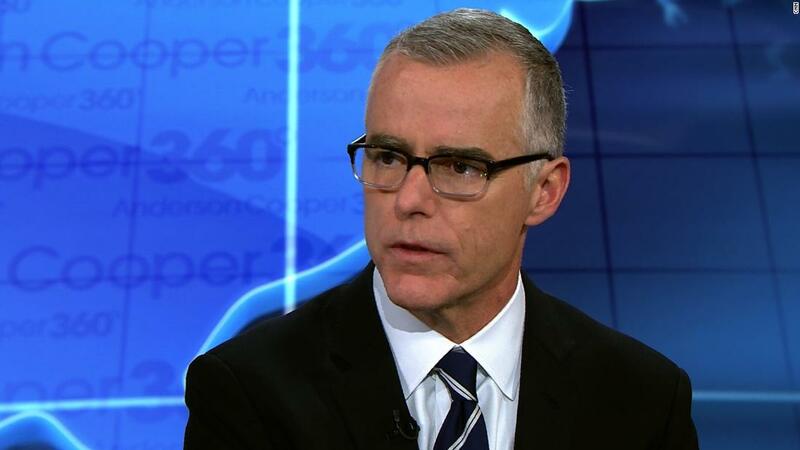 (CNN) Former acting FBI Director Andrew McCabe said Tuesday it is possible President Donald Trump is a Russian asset. McCabe is promoting his new book, “The Threat,” which paints a stark portrait of his time at the bureau under Trump, describing in vivid detail his version of interactions with top officials at the White House and Justice Department. The book was released Tuesday and became an instant best-seller. “He’s a liar and a leaker,” Conway said. The former acting FBI director went on the record in that “60 Minutes” interview confirming some previous reports about Deputy Attorney General Rod Rosenstein: That he raised the idea of wiring himself to surreptitiously record interactions with the President, and mused about which Cabinet officials might support an effort to invoke the 25th Amendment to oust Trump from office. Rosenstein has previously said that comment was mischaracterized. McCabe took over as the leader of the FBI when Trump fired James Comey in May 2017. McCabe was pilloried throughout his time leading the department and was eventually fired in 2018, just days shy of his announced retirement date. He’s under criminal investigation by federal prosecutors in Washington, DC, for misleading investigators in their probe of the FBI’s handling of the investigation of the Clinton Foundation. McCabe charged that the inspector general report that was used to justify his firing was the result of improper command influence, with it being clear that the President wanted him gone before his scheduled retirement date. CNN has previously reported McCabe opened an obstruction of justice probe into Trump before Mueller’s investigation began. It was an idea previously considered by the FBI but only started following former FBI Director James Comey’s dismissal in May 2017. Sources previously told CNN the decision to start the investigation included the President’s conversation with Comey in the Oval Office asking him to drop the investigation into his former national security adviser Michael Flynn. McCabe had harsh words for the President during his interview with Cooper, charging Trump with undermining the country’s top law enforcement agencies for political gain. He added that there is no doubt in his mind that the President is undermining the “effectiveness and strength” of government institutions. As to why he didn’t speak out earlier, McCabe said he felt he had to make an argument in a thoughtful way about how the President is undermining the justice system. McCabe said he did not continue to receive updates about the Russia investigation after Mueller was appointed. McCabe said he didn’t know if Rosenstein should have recused himself from the Russia probe. “It was an incredible time, the simple fact that the deputy attorney general and the acting director of the FBI were trying to figure out how to navigate a situation in which we thought the President of the United States might be involved in obstruction of justice and might be doing that to cover up some sort of inappropriate relationship with the Russians,” McCabe said. “It was a head-spinning moment,” he added. As he did in his book, McCabe also had unsparing criticism for former Attorney General Jeff Sessions.